Who else gets a little sad at the thought of all the beautiful flowers perishing after the main event? 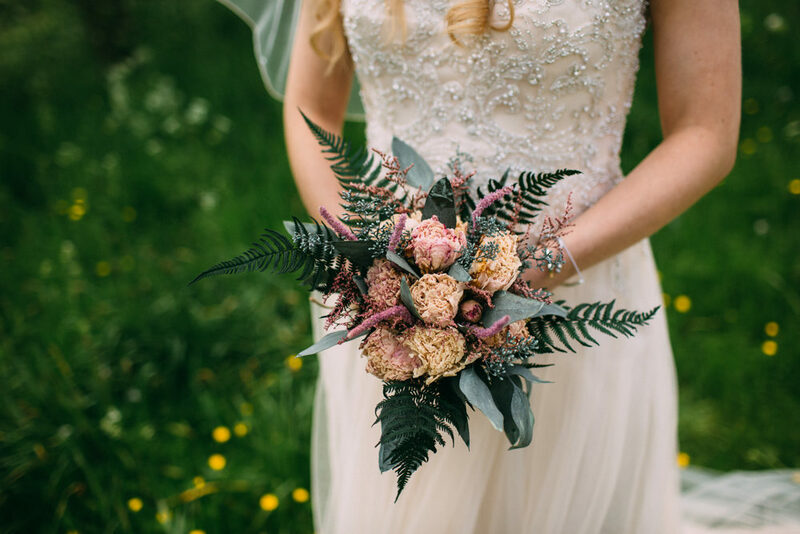 That’s why I completely love bride Victoria’s bouquet and flower crown, not only are they incredibly beautiful, but they are dried and preserved so they can be enjoyed for years to come. Total win win in my eyes. Plus the muted tones look absolutely stunning against her light gold Maggie Sottero gown. Have you seen the embellished bodice yet? SO pretty! 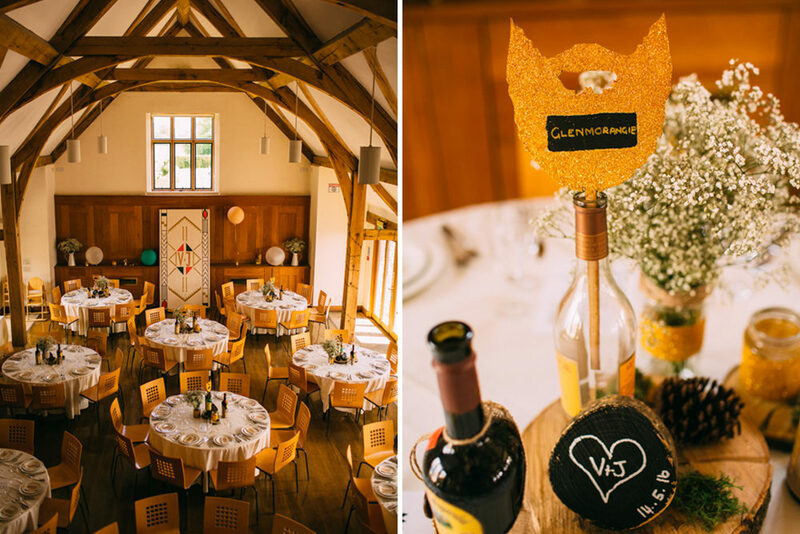 Sulgrave Manor in Northamptonshire made the perfect country venue to house the couples delicious DIY decor. They made fabulous use of wood slices, chalkboard paint, jam jars and glitter! Paying homage to groom Jon’s beard with beard prop table names and rustic centrepieces and signs. 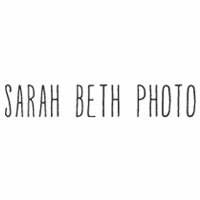 It was also the gorgeous backdrop for many of the couples portraits by Ania Ames Photography, which most definitely warm the heart. I love the unconventional seating arrangement around the pool of the beautiful Pieve de Pitti wedding venue in the picturesque Tuscan hills. Such a lovely setting, so elegantly arranged with a clear glass plate and a few lavender sprigs. 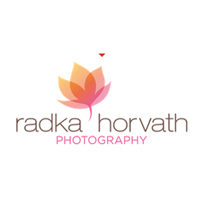 Sometimes simplicity really is best. I also adore Bride Keri’s lace Maggie Sottero gown. 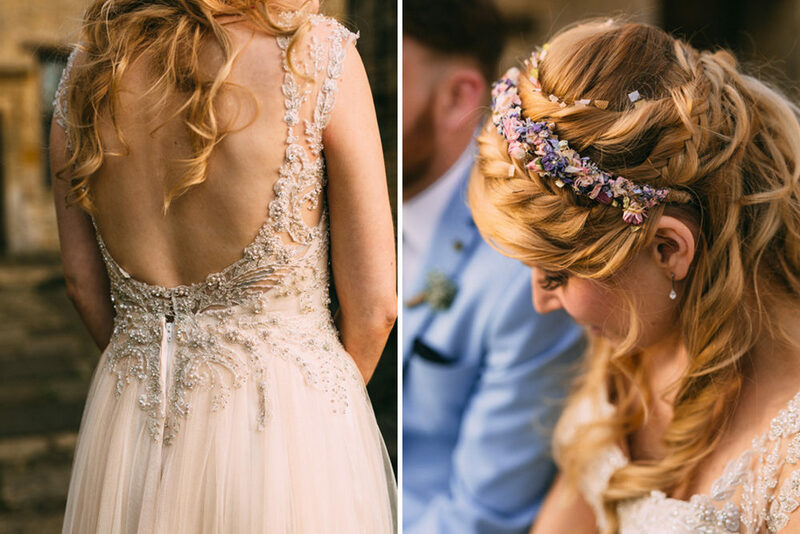 Those beaded cap sleeves are something else, picked out and complimented beautifully with her embellished Gillian Millon hair accessory. As far as bridal looks go, this has to be classic beauty at its best. 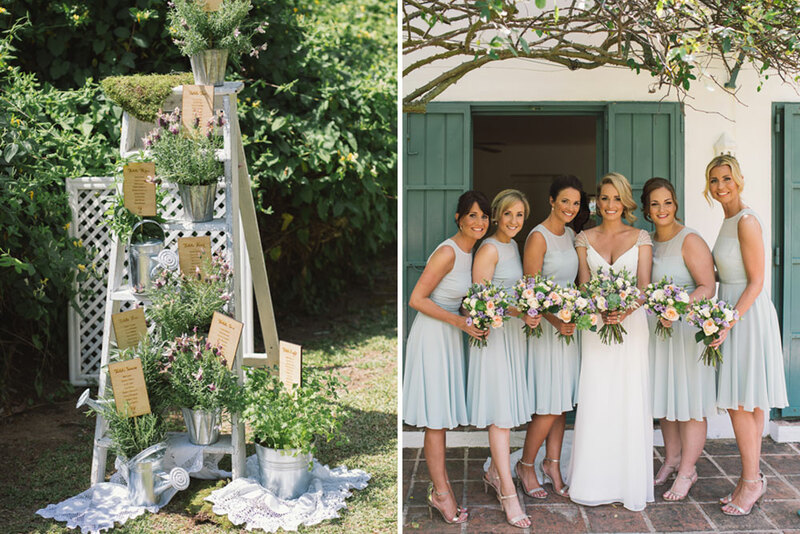 Add a few hanging lanterns, some gorgeous pastel pink Dessy Bridesmaids, an intimate outdoor ceremony and even a small rain shower won’t dampen the spirits of your guests. Who apparently started a very noisy rendition of “We’re singing in the rain” when the heavens opened. 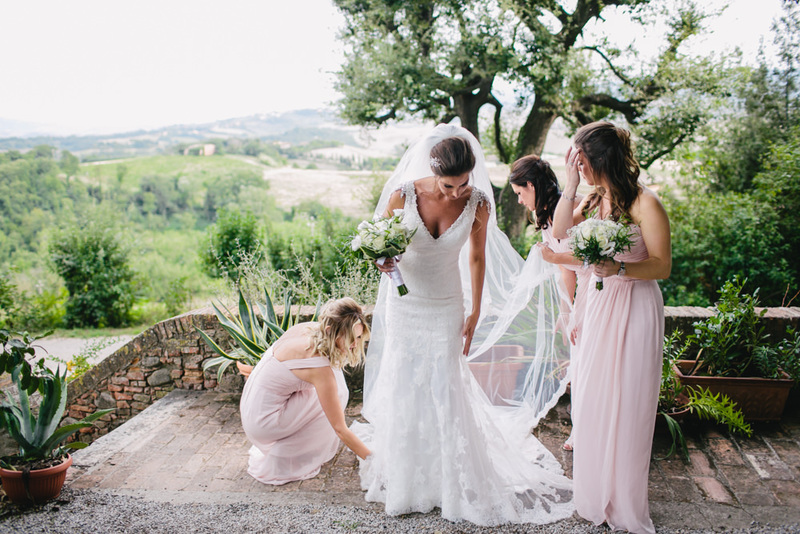 Absolutely brilliant and incredibly pretty destination wedding captured by Helen Abraham Photography. Everything you are about to see will put a huge smile on your face. 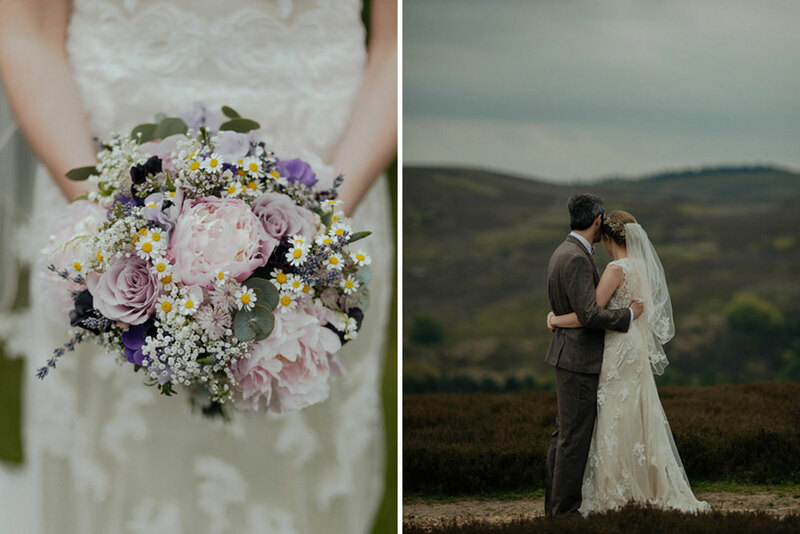 From the rustic old barn reception full of vintage trinkets to the breathtaking portraits of our gorgeous couple on the Hope Valley Derbyshire moors. 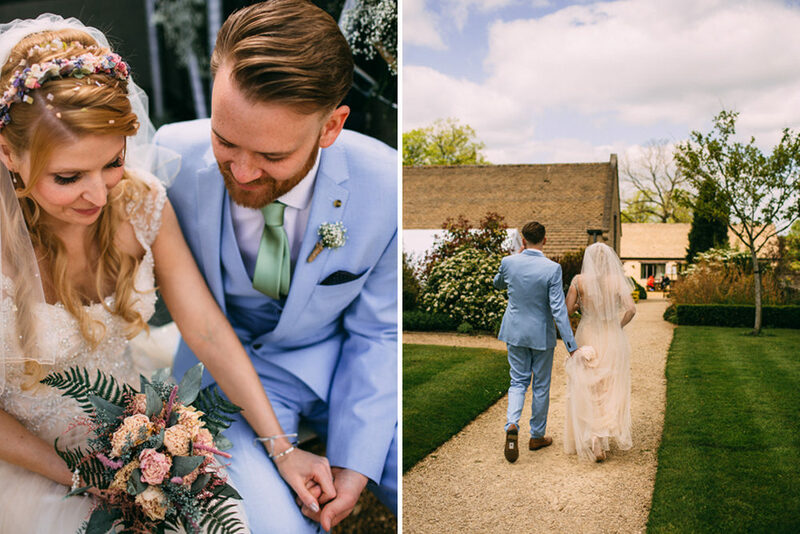 I simply adore Charlotte’s Maggie Sottero gown, with a gorgeous champagne slip making the intricate lace overlay look amazing and what could be more country than a groom in tweed. Perfect. 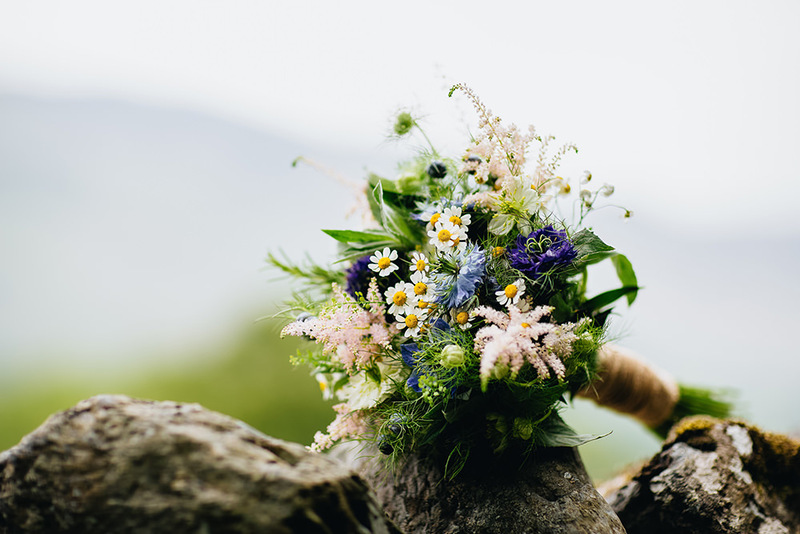 If you love the just picked wild flowers look, stacked antique books, ditsy vintage china and a wedding full of sentiment and love then you’re truly in for a treat. Victoria & Michael are utterly adorable saying “I do” only a stones throw form where Michael proposed. 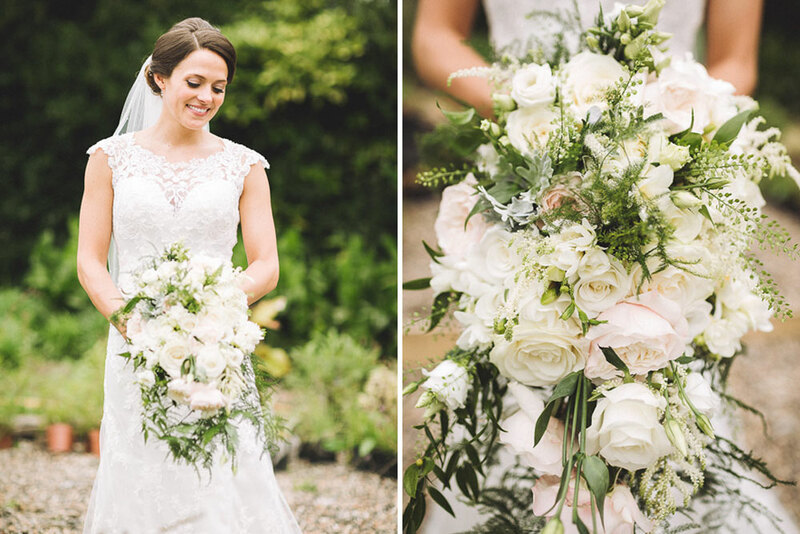 Choosing the rustic New House Farm barn in the middle of the Lake District as their gorgeous venue because of their love of nature, Cumbria and its stunning scenery. 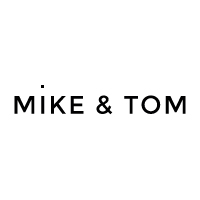 Their fabulous reception was decked in homegrown flowers, DIY crafts and finished with handmade bridesmaid dresses and matching groomsmen bow ties. Talk about talented. 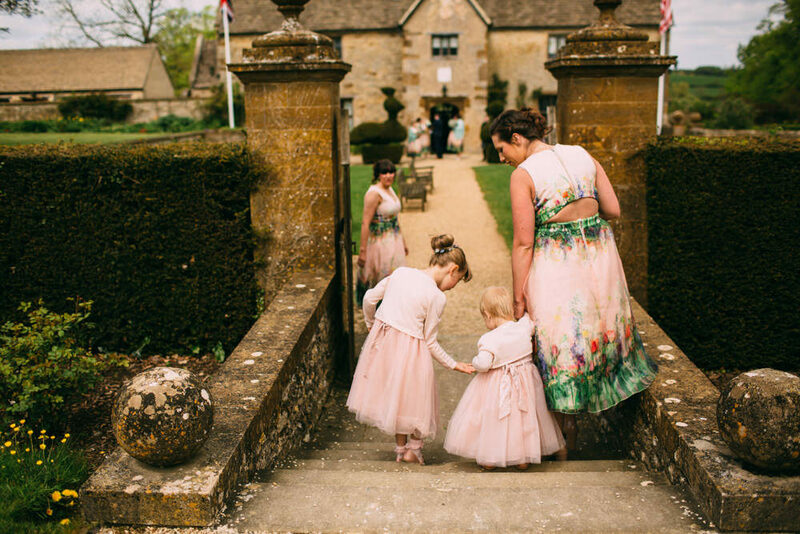 There was even a matching miniature dress for the beautiful baby flower girl. So adorable. Although there wasn’t a set colour scheme ‘something blue’ seemed to be the running theme and was the perfect chance for Victoria to add a pair of blue suede shoes to her surprisingly conventional, but totally gorgeous Shayla Maggie Sottero lace wedding dress, which she looks absolutely stunning in. Finishing off the day with pizza, lawn games and a folk music band, reflecting their personality in everything they did. 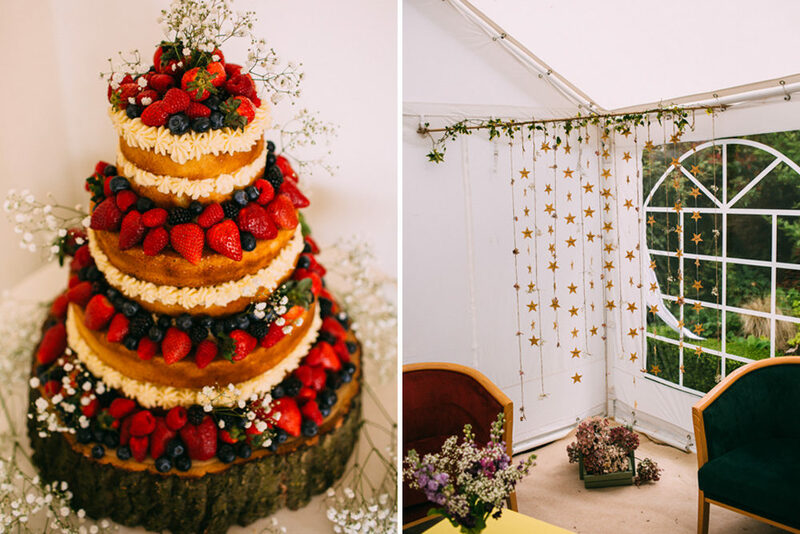 Wait until you see the cake too…..decorated with the sweetest wildlife couples you ever did see. 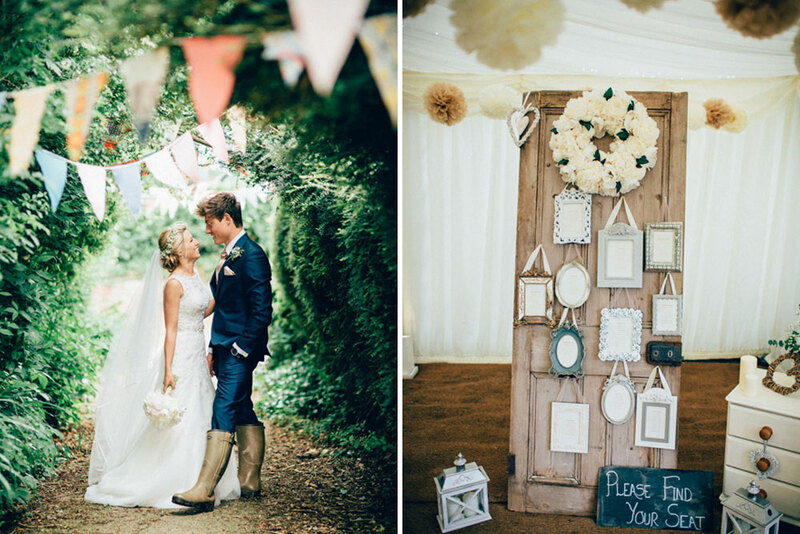 We’ve got another fabulous ‘at home’ wedding to start the week off with a wealth of shabby chic, vintage and DIY decor that really brings the marquee garden party reception to life. The table plan in particular is immense. Made out of an old door and photo frames and I also love that Bride Amelia brought along her dresser to display wedding portraits of family members on. It’s so lovely when all that you’ve envisioned, crafted and set up comes together and even more so when it all looks as spectacular as this beaut of a wedding. 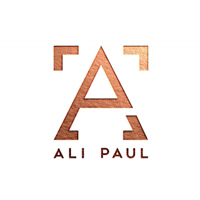 Don’t take my word for it, come take a peek….. 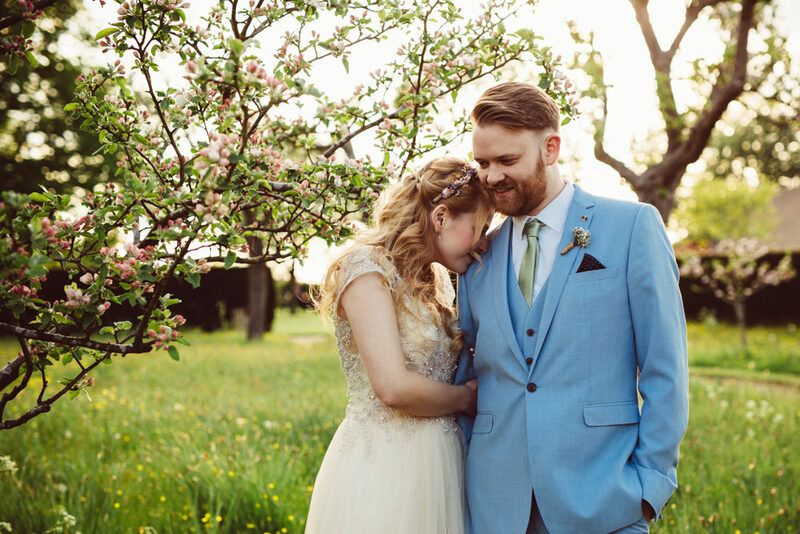 If you like your weddings pink, girly and sparkly then you are going to LOVE Hannah and Jamie’s outdoor wedding at The Barnyard in Kent’s countryside. 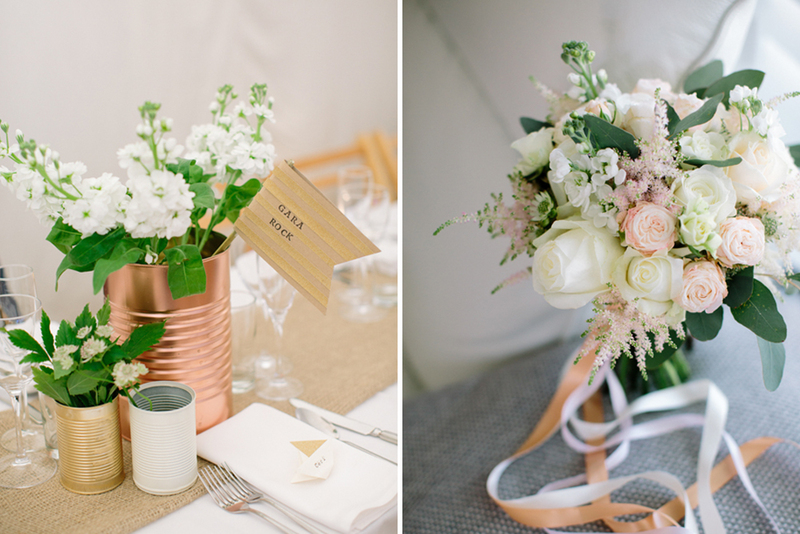 There are wonderful milk churns full of flowers as table centrepieces next to fabulous gold glitter table numbers and the cake….. Well. I simple adore the cake. 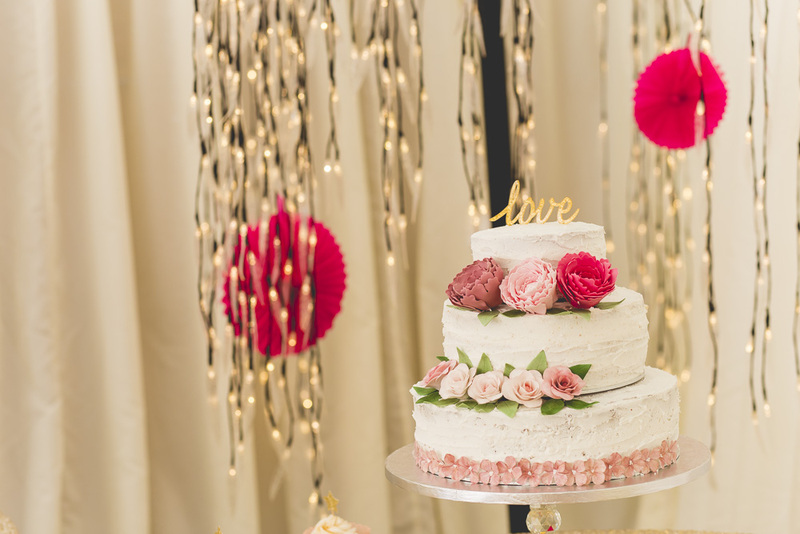 Baked by a talented friend and wonderfully displayed in front of fairy lights creating a beautiful focal point and giving it that extra wow factor. 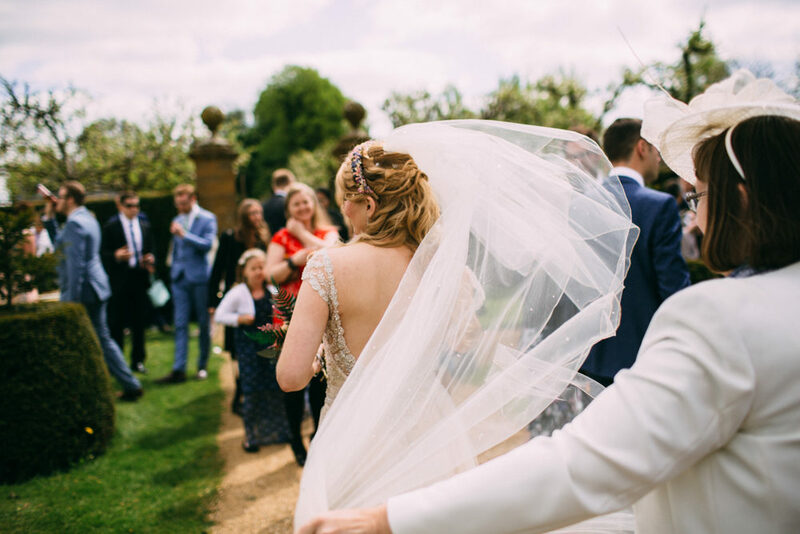 Which leads me perfectly onto Hannah’s show stopping lace Maggie Sottero Bronwyn gown with gorgeous key hole back.It’s utterly dreamy and she looks SO stunning in it, as do her bridesmaids in their handmade slinky blush pink silk gowns. But not to be totally out shone by the ladies, Groom Jamie opted for a funky peacock feather print lining in his dapper Ted Baker morning suit from Moss Bros which I have to say is totally fun. A truly cute couple, enjoying every bit of their day amongst the vineyards, even with the treat of rain.